Patrick was born and raised on the rural Mendocino Coast in Northern California by his parents, Sammie and Wendell Rickon. His family was active in many local faith-based communities, including the Antioch Fellowship and the Mendocino Presbyterian Church. He was also very involved in youth activities. Throughout his childhood, youth, and young adult life, Patrick had the opportunity to attend a wide assortment of local schools and educational programs. Upon graduating from high school in 1985, he divided his time between apprenticing with several local builders, traveling through Mexico and Central America, and riding his mountain bike. Little did Patrick know that the combination of his upbringing, and exposure to such varied educational opportunities, would prepare him for life in Nicaragua and for his work with Seeds of Learning. A strong and practical sense of how things worked, coupled with a desire to discover more about the world he lived in, set him on a path to making this world a better place. In 1987, he spent several months volunteering at the Casa de la Esperanza orphanage in Tijuana, Mexico. There he learned first-hand about the great discrepancies in our world. He also took the opportunity to improve his Spanish. In 1988 and 1989, Patrick had the opportunity to travel to Nicaragua with Todd Evans, Co-Founder of Seeds of Learning, and two different volunteer groups of North Americans, where they worked with Habitat for Humanity to build decent housing. A year later, he was encouraged by Todd and others to return to Nicaragua to serve as Interim Projects Coordinator for a small development initiative called Nicaragua Material Aid. During his free time, he developed a carpentry workshop program to teach under-resourced communities to build school desks and other furnishings out of scrap lumber. The success and positive reception of this project later led Patrick and Todd to found Seeds of Learning. 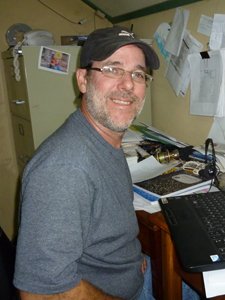 Over the next 20 years, Patrick served as SOL’s Nicaragua Director. He worked with SOL’s growing team of staff and volunteers to further develop the organization’s programs, development model, and community relationships. More recently, Patrick has stepped back from his role as (overall) SOL Nicaragua Director and returned to a more direct program role as the Ciudad Darío Regional Director. He is happily married to his life partner and wife, Izayana Carcache. They are the proud parents of two sons, Wendell Francisco and Ryan Tyler Rickon Carcache.